I've already shared my measly thoughts on 11 new TV shows that debuted last week. Are you a TV geek? I am. Some of my favorites, like Mad Men and Veronica Mars, were actually discovered on Netflix. 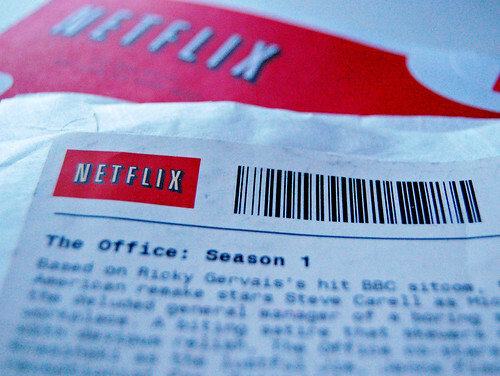 Netflix offers online flat rate DVD rental by mail and online streaming in the US and Canada. No late fees. No postage costs. No drama. What's a TV show you never miss? Important Details: Open to anyone in the US or Canada. Must enter before 11:59pm CST on Friday, October 1 to qualify. Winner will be chosen randomly using Research Randomizer and announced this weekend. Obviously, anonymous folks can't win unless they leave a name in the comment. P.S. Netflix only knows what I like to watch - they don't know the first thing about the real me or this giveaway. I "Like" on FB as well. Also a follower on the Twitter. What a great, creative giveaway. Our family would love to get this. The show I never miss is Grey's Anatomy and I'm so glad it's started again. Adventure Time (with Finn and Jake) oh man, DVR that from Cartoon Network. yep... I'm a nerd! Castle and Brothers&Sisters. Love those shows! I never miss "The Office"! Parenthood it debuted last year, and quickly became my favorite show. We love netflix!! I never miss The First 48, love it! I never miss Grey's Anatomy or Survivor!! I looooove "Top Chef" (and its spinoffs). I never miss my Grey's Anatomy!!! Fingers crossed for a big W! I never miss the Housewives of New Jersey! I'm also hooked on Dancing With the Stars. I follow you on Twitter (@willblogforshoe)! I only get to choose one lol? I never miss Rescue Me. I never ever miss Mad Men or Dexter! I never miss the Mentalist! I love that show! I never miss Army Wives. I love love love Jersey Shore... yes... it's totally trashy! I never miss The Big Bang Theory! I never miss Amazing Race! The Middle and Desperate Housewives. It used to be lost, but now it's fringe,community and modern family. There are quite a few that I never miss. I love Medium and the new show Haven. I could go on but I won't. Great contest. I also discovered Veronica Mars from Netflix. Thanks!! I dabble in various things but the only show I'm committed to watch every season is Biggest Loser. What can I say? Chub TV inspires me. My twitter bird is following your twitter bird around and reporting back to me. Wait, that sounds sort of bird stalkerish when I say it like that. Mad Men! I never miss an episode and watch the encore presentation every time. The only time I missed one, I was on vacation and the first thing I did when I got home was watch it on DVR. I'm hooked on the vampire diaries. That would be Boardwalk Empire. Breaking Bad, been my fav show for the past 3 seasons, can't wait for season 4 next year! Between Netflix and online viewing there aren't any that I have to be in front of the tv at a certain time for, but I do like to keep up to date on 30 Rock. Back in the day Farscape was my, "Sorry, we can't get together then; I have to watch tv!" time. i try to not miss white collar - it's my favorite right now! This may sound strange but I never miss Pawn Stars. I never miss The Office. Burn Notice! I have watched this from the very beginning and never miss an episode! I never miss Cash Cab. I love the show. I love love love Top Chef. I laugh every week at Shawn and Gus on Psych. The only show I've ever followed religiously was LOST. 30 Rock is the only thing that comes close. I <3 Tina Fey. I have never missed an episode of The Big Bang Theory!! Also, I never miss Project Runway. Ever! Two shows I never miss are Grey's and The Office. Real Housewives. I am a RH junkie! Follow you on twitter @cheapskatemom thanks! I don't have a "regular" tv (we have a projector) & so I don't get to watch regular tv shows. BUT I love Netflix- it's how I get my fix. lol I'm a huge fan of Burn Notice & never miss it! I never miss fringe. great show. I try to never miss Two and a Half Men - I need the laughs! I never miss the Daily Show. Oh my goodness there's too many to name! The Office, Gossip Girl, Ellen's show, Modern Family! We like Grey's Anatomy and have been watching Rookie Blue on Hulu. We also have gotten into Castle and Parenthood. this is embarrassing to admit but i've never missed an episode of survivor since the show started. I like to watch NCIS. I try not to miss Desperate Housewives. I follow on twitter @007blond. I love Doctor Who, when there's a season, otherwise we love watching House. American Idol. However, I'm not so sure about that for this coming year. liked you on fb- jenna o.
I never miss Gossip Girl or CSI. And I'm really loving the new Hawaii Five-O series. I never miss any of the csi and ncis! I don't miss an episode of Grey's Anatomy. I never miss Private Practice. I now like Jamie's Rabbits on Facebook. I am now following Jamie's Rabbits on twitter. I never miss Hells Kitchen! uh, should I lie or should I tell u the truth. We don't watch television in our house. We don't have cable and we're too far away to pick up anything via antenna. But we do have a TV and we do watch DVDs!